Nordic farmers, Brahms in B minor, and Keynesian economic discussions may not seem to share a lot of common ground at first glance. But they do—at least on public radio. The eclectic mix of news, talk, and music available over the airwaves courtesy of public radio stations throughout the U.S. would seem a perfect fit for the iPhone and iPod touch. After all, National Public Radio’s assorted podcasts are a fixture among the Top 10 lists in the iTunes Store. A pair of public radio-friendly apps hope to make a similar splash on the App Store’s charts. Public Radio Tuner from American Public Media and MPR Radio from Minnesota Public Radio provide a similar experience, though each offer their own spin. Public Radio Tuner is a study in breadth, streaming hundreds of stations. MPR is focused on all the streams from one station. Live and Local: Public Radio Tuner’s Local feature scans the airwaves to find a list of public radio stations near your current location. All apps considered, the most useful public radio app has to be the Public Radio Tuner The free app provides a catalog of hundreds of public radio stations from across the country. You’ll find the variety inherent in New York’s twenty one public radio stations. And you can learn about the unique perspectives of public radio from outliers like KHPR-FM from Hawaii and Alaska’s native Voice, KNBA from Anchorage—one of the eight available Alaskan stations. You cannot underestimate the depth of variety in the available stations. Then again, a random sampling of stations often ended with the same type of content each day. It was fun to check which classical song was playing in Tallahassee, Boston, Chapel Hill one Sunday morning. By far the most useful feature is Public Radio Tuner’s Local screen. It prompts you to allow Public Radio to access your current location. Tap OK, and the app quickly delivers a list of pubic stations sorted by distance from your current location. 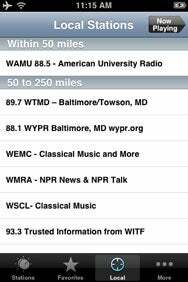 From my Northern Virginia home, Public Radio Tuner correctly found WAMU 88.5 within 50 miles of me as well as several Baltimore and Norfolk stations within 50 to 250 miles from me. This is most useful if you are driving through an area unfamiliar to you and want to get local news and weather. 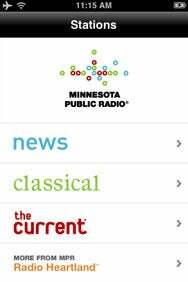 Fearsome Foursome: MPR Radio features content from just one station, but divides it into four distinct streams. MPR Radio offers a pleasantly designed interface with a minimal footprint. Select one of the four streams, press play, listen to a brief message and then enjoy your stream. As with all apps that stream audio, these apps work best with a Wi-Fi connection but are also passable over 3G. EDGE-only listeners, beware. One closing note: According to American Public Media, future plans for the Public Radio Tuner include “a catalog of on-demand audio [and] … direct listener contributions…” Sounds like things will only get better for public radio fans. Public Radio Tuner is compatible with any iPhone or iPod touch running the iPhone 2.x software update, while MPR Radio requires the iPhone 2.1 software.